Are you looking for new things to do with your sourdough starter? 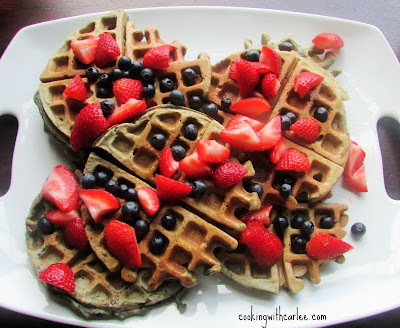 These blueberry waffles are just the thing! Serve with strawberries and maple whipped cream for a patriotic treat or just enjoy with some syrup for a weekend breakfast or brunch delight! I LOVE waffles! I know, it probably isn't a huge surprise based on how big my sweet tooth is. But belgian waffles hold a special place in my heart. As a kid, we were members of the country club just up the road from us. We would all pile in the golf cart and head up there to spend the day in the pool. Most of the time it was just for fun, but there were practices for the swim team mixed in. We also took some tennis lessons and golf lessons, all skills which are now completely lost! But we always had a good time. But my favorite part about the country club was Sunday brunch. I think brunch was my favorite mostly because of the waffles. Big golden brown belgian waffles with all of the strawberries and whipped cream you could pile on top of them. A little girl with a big sweet tooth's dream come true! There are so many delicious berries out there right now and I just couldn't pass up on buying a couple of pints of blueberries and a huge thing of strawberries last time I was at the store. So my mind started clicking. 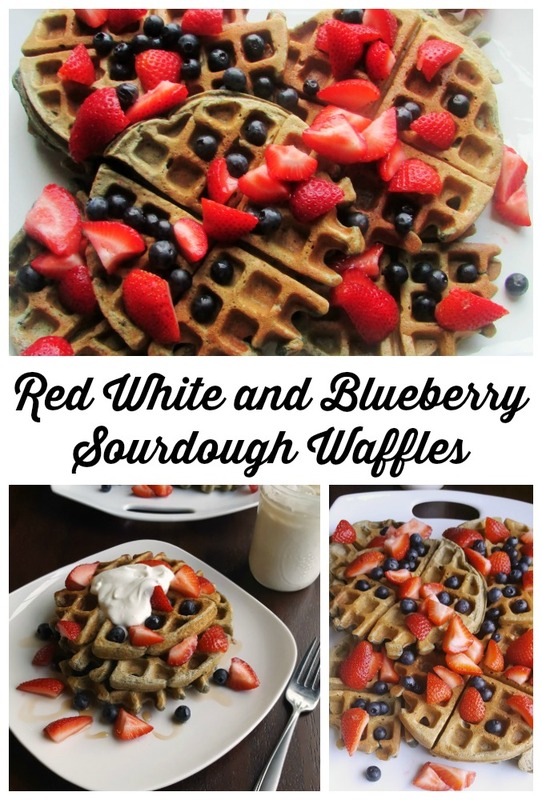 How fun would it be to have red, white and blueberry waffles? I have been wanting to try using Bertha (my sourdough starter) in waffles for a while now. So I googled blueberry sourdough waffles. Do you know what came up? I mean total crickets, people! Can you believe it? Meanwhile, back at the ranch, we made some of MiMi's maple whipped cream for piling on top. Let me tell you, a waffle or two covered with tons of berries and a nice big dollop of whipped cream made for a very satisfying breakfast for dinner entree. It would be great for breakfast as well, or dessert for that matter! 1. Stir together all of the sponge ingredients, cover with plastic wrap and let sit at room temperature overnight. *2. 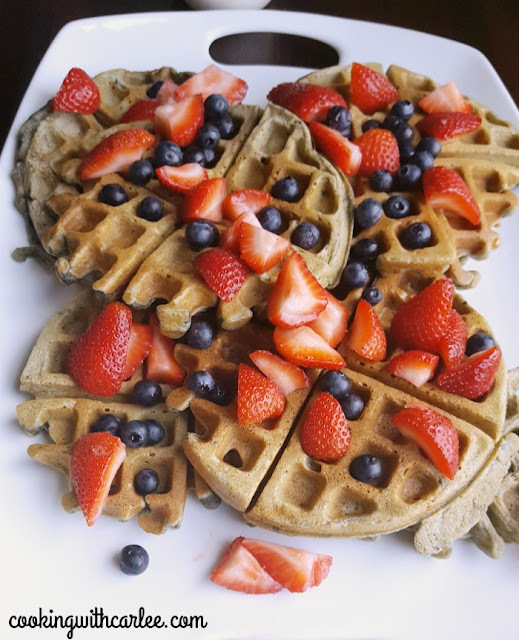 When you are ready to make the waffles, place the eggs and blueberries in a blender and mix until the blueberries are finely chopped and mixture has a nice blue color. It doesn't have to be perfectly smooth, just mostly pureed. Stir egg/berry mixture, oil, salt and baking soda into sponge.3. Preheat your waffle iron and spray it with cooking spray. Fill 2/3 full and cook until golden brown.4. Remove from waffle iron. They are the best if served immediately, but can be held in a warm oven if you want to serve the whole batch at once. I put them on a cooling rack over a baking sheet in a 250 F oven until ready to serve5. Garnish with berries, syrup and maple whipped cream and watch them disappear. *If you can't start the sponge the night before, warm the butter milk before you stir it in. Then let sit at room temperature (or in the oven with the light on) for as long as is feasible before you mix in the rest of the ingredients. If you are on a really short timeline, increase the baking soda slightly and proceed. lunch? They would make a perfect lunch. Of course they would make a great lunch... and oh, the whipped cream. It was something, wasn't it?! A delicious breakfast! The maple whipped cream puts it over the top! I think so too! We've had it on pumpkin pie before and it was delicious, but this was my first time using it on waffles. Of course they were a match made in heaven! That's so cool that you used sour dough starter! Someday I'm going to learn how to make bread and would love to make sourdough. Anyway, great waffle recipe! I have been loving mine. I started mine with wild yeast, so it took a few days but was really easy (and super cheap, just flour and water!) I gave some of my starter to my mom for Mother's Day and she has been loving it too. Bertha (mine) and Granny (hers) have made lots of yummy bread, muffins, really easy skillet bread and now waffles! These are my kind of waffles and perfect for the upcoming holiday too! Thanks for sharing this beautiful creation! Thank you! They are definitely perfect for the 4th, but I'd be happy to eat them any day! I find it hard to believe that there are no sourdough waffle recipes out there, Carlee! Well done for forging ahead. Yours came out beautifully! I've never had a sourdough waffle before, but boy do these look yummy ;) Have a great 4th Of July, Carlee. They really are good! They get nice an crisp on the edges but are so soft and airy on the inside. Have a wonderful 4th! 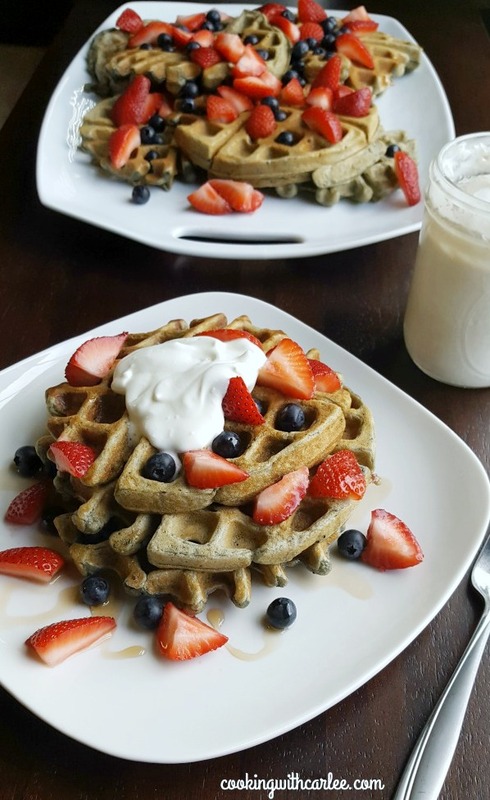 What a great idea to use sourdough starter in waffles--I love sourdough and know this would be the perfect compliment to a sweet topping! Sourdough works really well in waffles. They are best if you start the night before to give the starter a chance to work its magic, but you can shortcut it if you have to. Sourdough waffles sound so unique. Love that! I often think it would be fun to belong to a country club for those memories and favorite meals all the time, that sense of belonging. But in reality, I know I'd be much more likely to stay home and make my own waffles. As kids we loved the country club mostly for the pool (and the waffles and french dip sandwiches!) Now I am totally with you, I'd just assume make my own waffles and hang out in my jammies at home. I love sourdough, what a great idea! So cute for the Fourth too! Thank you! I have really been enjoying playing with my sourdough and waffles made a great vehicle to use some starter and my stash of berries! Ha! Thanks, Liz! I think waffles are a perfect dinner! I love how colorful these are! So perfect for this coming weekend thanks for sharing! Thank you! It was fun to make something so seasonal and festive. Thank you! We really enjoyed them! Maple whipped cream sounds awesome!Thanks for linking up to Merry Monday! Pinned! Have a great week! It is the best!! Thanks and have a lovely long weekend! Hope you are having a great week Carlee! You have to try the whipped cream, Jessica! It is so good! We loved in on pumpkin pie bars in the fall, but it was perfect on these pancakes too. I've done a cocoa one too that is lovely, and mocha and one with candy cane bits in it for hot chocolate!! YUMMMMMMMMY! As a kid, I was always a sucker for a Belgian waffle, too! Kudos to you! What a fun idea to mix the berries with the eggs like that. It was a great way to get them incorporated and the eggs beaten all at once. I wanted little fleck of blueberry throughout rather than a few berries here and there. Thanks! YUM! These sound great! I can only have waffles for breakfast here, because my husband has some weird issues with "breakfast foods" not being for any other meals! I have been working on getting him past this for 6 years now, and haven't got him to budge an inch! Ha! Darn it! I love doing breakfast for dinner. I don't think it's my husband's favorite either, but he at least tolerates it every once in a while. It's the only way I get to make my favorite breakfast foods as we rarely all sit down to a real breakfast. 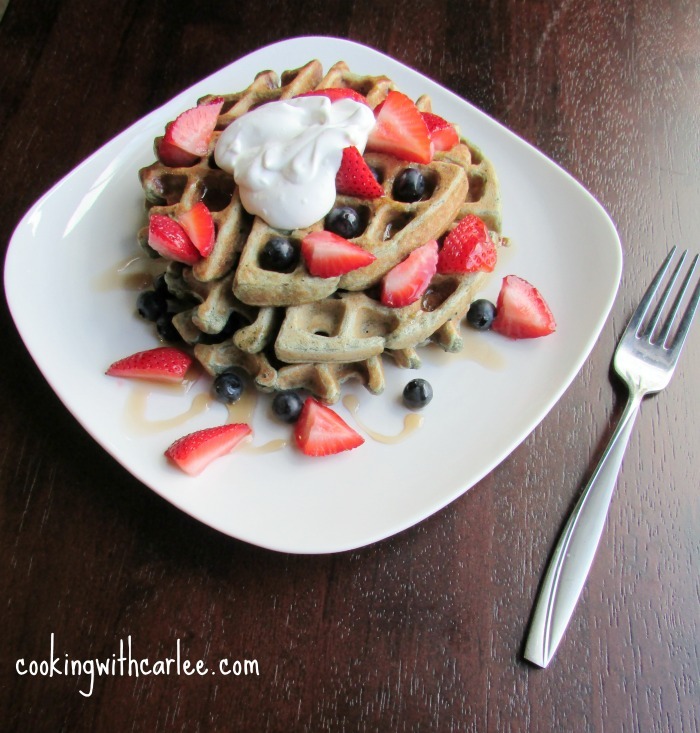 I bet those waffles taste amazing Carlee! Thanks, Julie! There really were delicious! Have a great 4th! HA! Yep, just to get you in the mood! I've read you can do sourdough with any grain. It would be fun to try! The maple whipped cream really helps take it to the next level. Thanks so much for sharing your awesome Sourdough Waffles with us at Full Plate Thursday this week. Hope you are having a great weekend and come back to see us real soon! Thanks, Miz Helen! I hope your weekend is full of fun, friends and family! Ha! It is hard to get up and have a big breakfast ready to go, morning person or not. But that doesn't mean we should deprive ourselves of waffles! What a great idea! Sourdough starter is one of those things I want to try, but when I think of the commitment of baking every week I get overwhelmed. This would be a great use for it! Thanks for linking this post up to the #Celebrate365 Patriotic party! We use it for pizza dough more than anything else. I also make muffins. I tend to make more bread during the fall and winter, this time of year I stick to quick and easy!